Description:Used 2012 BMW X5 Xdrive35i Awd 4dr Suv for sale - $14,295.00 with 96,500 miles. 2012 BMW X5 xDrive 35i AWD SUV This 2012 BMW X5 xDrive 35i AWD SUV is super nice inside & out, with only 96,500 well-maintained miles! Loaded w/safety & comfort features, including the desirable premium & cold weather packages! This well-equipped SUV has the design & quality BMW is known for, and definitely won't disappoint! New tires & brakes! Freshly serviced & inspected! Great CARFAX! Upgradable warranty package included! 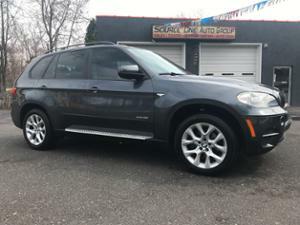 Don't let this sleek BMW X5 get away - call 215-513-4100 or visit www.sourceoneautogroup.com today! Addt'l. Info. : 3.5L L6 DOHC 24V twin turbo engine, 6-speed shiftable automatic, AWD, 96,500 mi, TRAC/VSC, hill descent control, 4-wheel ABS & disc brakes, EBA, dual front, side & side curtain airbags, pwr locks, keyless, central locking system, pwr tilt/tele steering wheel w/controls, rain sensing interval wipers, cruise control, automatic HID headlights, fog lamps, 1-touch pwr windows, rear window shades, pwr panoramic roof, pwr heated exterior mirrors, auto dimming rearview mirror w/compass, SOS, programmable garage door opener, dual automatic climate control, rear dual HVAC controls, power heated front seats w/DS memory, 60/40 split folding rear seat, cup holders, AM/FM CD/AUX/USB, satellite ready, Navigation, Bluetooth, rear camera/parking sensors, trip computer, digital clock, outside temp display, illuminated visors, rear defrost/washer/wiper, factory mats & manuals, running boards, retractable cargo cover, power hatch, roof racks, alloy wheels, Space Gray Metallic, Black Leather. Description:Used 2012 Jeep Wrangler Jk Unlimited sport for sale - $18,295.00 with 116,287 miles. 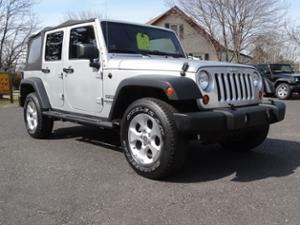 2012 Jeep Wrangler Sport Unlimited 4WD 4-Door Automatic Get ready to go top down for the summer! This sharp-looking 2012 Jeep Wrangler Unlimited Sport 4WD runs & drives great, and overall is in good condition inside & out! Newly serviced & inspected! Good tires! All new brakes & front rotors! Upgradable warranty included! Call 215-513-4100 or visit www.sourceoneautogroup.com today! Addt'l. Info. : 3.6L V6 DOHC 24V motor, 5-speed shiftable automatic, 4WD, 116,287 miles, dual front airbags, 4-wheel ABS & disc brakes, EBA, TRAC/VSC, hill descent control, p/locks, child locks, keyless entry, fog lamps, tilt steering wheel w/controls, interval wipers, cruise control, AM/FM CD/AUX, satellite ready, 12V power outlets, p/windows w/front 1-touch, heated p/exterior mirrors, visor mirrors, air conditioning, tach, temp gauge, trip odometer, manual front bucket seats w/center console, fold flat rear seat, TPMS, full-sized spare, alloy wheels, all-weather mats, manuals, running boards, black soft top, bright silver exterior, black/gray cloth interior. Description:Used 2014 Jeep Wrangler Unlimited Sport 4x4 4dr Suv for sale - $28,495.00 with 31,573 miles. 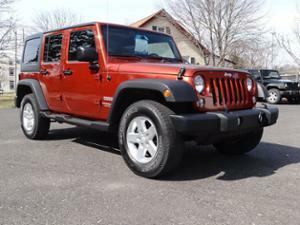 2014 Jeep Wrangler Unlimited Sport 4-Door 4WD Automatic Wow, this 1-Owner 2014 Jeep Wrangler Unlimited Sport 4WD is in excellent condition inside & out and has only 31,573 miles! Gorgeous Copperhead pearlcoat! 3-piece Freedom Hard Top! 4-door! Automatic! Newly serviced & inspected! NO open recalls! Upgradable warranty package included! Call 215-513-4100 or visit www.sourceoneautogroup.com today! Addt'l. Info. : 3.6L V6 DOHC 24V motor, 5-speed automatic transmission, 4WD, 31,573 miles, TRAC/VSC, Hill descent control, 4-wheel ABS & disc brakes, EBA, dual front airbags, fog lamps, tilt wheel w/steering wheel controls, interval wipers, cruise control, air conditioning, rear defrost/washer/wiper, p/locks, keyless entry, p/windows w/front 1-touch, p/ heated exterior mirrors, manual front bucket seats w/center console, fold flat rear seat, auto dimming rearview mirror, tachometer, temp gauge, trip odometer, visor mirrors, AM/FM CD/AUX, subwoofer, satellite ready, Bluetooth phone, front tow hooks, tow receiver, running boards, TPMS, alloy wheels, full-sized spare, factory mats & manuals, black 3-piece hardtop, copperhead pearlcoat exterior, black cloth interior. Description:Used 2013 Subaru Forester 2.5 X Premium Package for sale - $16,995.00 with 28,045 miles. 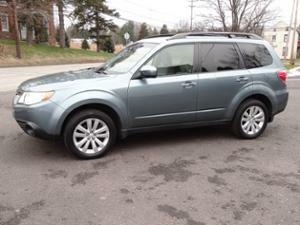 2013 Subaru Forester 2.5x Premium AWD SUV Wow, check out this super clean 2013 Subaru Forester 2.5x Premium AWD SUV! 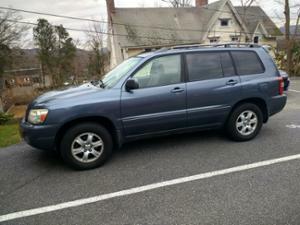 This Forester has only 28,045 miles! Perfect CARFAX! Newly detailed, serviced & inspected! Desirable color combination! Loaded w/safety & comfort features! Upgradable warranty package included! Don't wait too long - a Subaru this nice won't be around for long! 215-513-4100. Addt'l. Info: 2.5L H4 SOHC 16V motor, 4-speed automatic transmission w/manual shift mode, AWD, VDC, dual front, side & side curtain airbags w/rollover sensor, 4-wheel disc brakes & ABS, EBD, TPMS, DTRL, fog lamps, a/c, rear defrost/washer/wiper, AM/FM CD/SAT/AUX/USB, Bluetooth phone, digital clock w/outside temp display, auto dimming rearview mirror w/compass, power driver's seat, heated front seats, multi-function center console box, 60/40 split folding rear seat w/cup holders & armrest, tilt/tele steering wheel w/controls, interval wipers, cruise control, power locks, keyless entry (2 FOBS), power windows w/driver's side auto up/down, power panoramic roof, power heated exterior mirrors, windshield wiper deicer, AUX power outlets, map lights, overhead sunglass storage, roof racks, splash guards, 17'' alloy wheels, factory mats & manuals, window sticker. 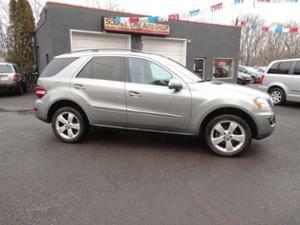 Description:Used 2010 Mercedes-Benz M-Class ML350 4Matic for sale - $11,995.00 with 115,261 miles. 2010 Mercedes-Benz ML350 4Matic Premium Pkg SUV This 2010 Mercedes-Benz ML350 4Matic SUV is super clean inside & out, and has only 115,261 well-maintained miles! Great CARFAX! Loaded w/safety & comfort features! Freshly detailed, serviced & inspected! Upgradable warranty included! 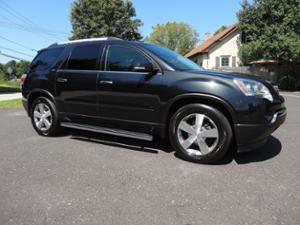 Stop by and check out this awesome ML350 before it's gone! 215-513-4100. Addt'l. Info: 3.5L V6 DOHC 24V motor, 7-speed automatic w/OD, paddle shift, AWD, TRAC/VSC, ESP, Downhill Speed Regulation, Off-Rood Driving Program, 4-wheel ABS & disc brakes, EBA, dual front, side & side curtain airbags, automatic headlights, front/rear fog lamps, DTRL, Bluetooth phone, AM/FM CD, Satellite ready, IPOD/AUX inputs, NAVI, back-up camera, power tilt/tele steering wheel w/controls, rain-sensing interval wipers, cruise control, dual automatic climate control, heated power front seats w/driver's side memory, power moon roof, 1-touch power deep-tinted windows, power heated exterior mirrors w/turn signals, rear defrost/washer/wiper, power hatch, power locks, keyless entry (2 FOBS), illuminated visor mirrors, auto dimming rearview mirror, garage door openers, 60/40 split fold flat rear seat, roof racks, alloy wheels, full-sized spare, TPMS, factory mats, digital manuals, silver exterior, black leather interior w/wood grain trim. 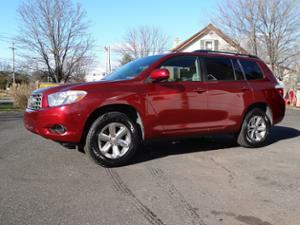 Description:Used 2010 Toyota Highlander 4wd 4dr Base for sale - $11,995.00 with 118,359 miles. 2010 Toyota Highlander Base AWD SUV This 2010 Toyota Highlander Base 4WD SUV is really nice inside & out, and has only 118,359 miles! It has an awesome CARFAX w/great service history, is newly inspected & has 4 brand new Goodyear tires! This 7-passenger 4WD SUV is nicely optioned w/safety & comfort features, and is safe, reliable & inexpensive to own & maintain! Don't let this super-nice Highlander get away - call 215-513-4100 or visit www.sourceoneautogroup.com today! Addt'l. Info. : 3.5L V6 DOHC 24V motor, 5-speed automatic w/manual shift, snow mode, hill descent control, 4WD, TRAC/VSC, 118,359 miles, est. mpg: 17/23, 4-wheel ABS & disc brakes, EBA, automatic headlights, DTRL, dual front, side & side curtain airbags, pwr locks, keyless entry, child locks, pwr mirrors, pwr windows w/DS 1-touch, tilt/telescoping steering wheel w/controls, interval wipers, cruise control, a/c, rear HVAC controls, rear defrost/washer/wiper, tach, temperature gauge, trip odometer, AM/FM AUX/CD player, AUX power outlets, digital clock, front bucket seats, adjustable 2nd row seat w/console & stored jumpseat, 3rd row seat, visor mirrors, factory mats & manuals, rear cargo mat, steel wheels w/hubcaps, full-sized spare, roof racks, salsa red pearl exterior, ash (gray) cloth interior. 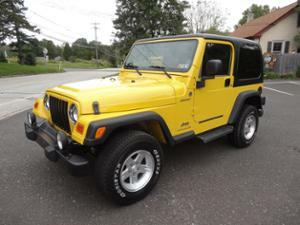 Description:Used 2006 Jeep Wrangler Tj sport for sale - $16,995.00 with 52,240 miles. 2006 Jeep Wrangler TJ Sport 2-Dr 4WD SUV You won't believe how nice this 2006 Jeep Wrangler TJ Sport 4WD is! Only 52,240 original miles! This Wrangler was a southern vehicle for most of its life, so any typical rust issues are almost non-existent on this one! This Jeep is a 2-door with a black hard top, and has an upgraded aftermarket Kenwood AM/FM CD/SAT/USB/AUX Bluetooth radio! It's very clean inside & out, and runs & drives 100%!! Newly serviced & inspected! Upgradable 3 month/4,500 mile limited powertrain warranty included! You won't find many with miles this low, and in this condition, so don't wait too long to see it, or it will be gone! Call 215-513-4100 or visit www.sourceoneautogroup.com today! Addt'l. Info. : 4.0L L6 OHV 12V motor, 6-speed manual transmission, Dana 30/186 mm front axle, Dana 44 3.73 rear axle, 4WD, 52,240 miles, 4-wheel ABS, front disc/rear drum brakes, dual front airbags, fog lamps, air conditioning, rear defrost, tilt steering wheel w/controls, interval wipers, cruise control, AUX power outlets, Kenwood AM.FM CD/AUX/USB/SAT radio w/Bluetooth connectivity, manual adjustable front seats, removable folding rear seat, full size doors w/manual windows, mirrors and locks, locking glove box & center console, tachometer, temp gauge, trip odometer, factory manuals, aftermarket floor mats, alloy wheels, full-sized spare, tow hitch receiver, side steps, Solar Yellow w/black hard top, dark slate gray cloth interior. Description:Used 2012 GMC Acadia SLT1 AWD for sale - $12,995.00 with 110,322 miles. 2012 GMC Acadia SLT-1 AWD SUV This 2012 GMC Acadia SLT-1 AWD SUV is really nice! It's super clean inside & out, and runs and drives perfectly! This sharp looking 8-passenger, double black Acadia has 110,322 well maintained miles, and was just newly serviced & inspected! Nicely loaded w/safety & comfort features such as double roof, heated seats, rear HVAC controls, power hatch & more! New tires! Clean CARFAX! Upgradable limited powertrain warranty included! 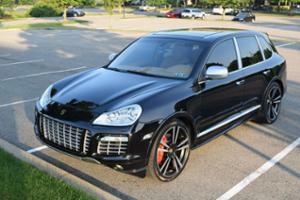 Call 215-513-4100 or visit www.sourceoneautogroup.com. Addt'l. Info. : 3.6L V6 DOHC 24V motor, 6-speed automatic, AWD, 110,322 miles, 4-wheel ABS & disc brakes, EBA, TRAC/VSC, dual front, side & side curtain airbags, parking sensors, backup camera, automatic headlights, fog lamps, DTRL, tilt/tele steering wheel w/controls, interval wipers, cruise control, power windows, locks, roof, rear hatch & mirrors, keyless entry, child locks, VAT, power heated front seats, folding adjustable 2nd row split bench seat, second row fixed glass moonroof w/shade, folding split 3rd row seat, dual automatic climate control, rear HVAC controls, rear defrost/washer/wiper, AM/FM radio w/CD, AUX input, satellite ready, Bluetooth phone, AUX power outlets, auto dimming rearview mirror w/telematics, Homelink, illuminated visor mirrors, tach, temp gauge, trip computer, running boards, roof racks, front mats, factory manuals, alloy wheels, TPMS, carbon black metallic exterior, black leather interior. 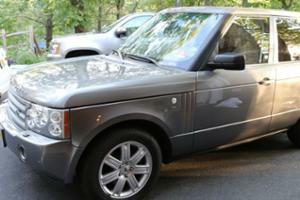 Description:Used 2008 Land Rover Range Rover for sale - $19,500.00 with 15,323 miles. 2008 Land Rover Range Rover HSE 4.4 15,323 miles only, always garaged and used for family driving, some good weekends, never on snow or even on rain. never smoked, No accidents. All service done by land rover dealer.The car is in perfect condition, exterior, interior, tires and brakes come with rubber mats front back, and trunk spare tire cover. The car has no issues with mechanical, electrical,or any other problem. Description:Used 2014 Mercedes-Benz M-Class for sale - $25,600.00 with 44,700 miles. 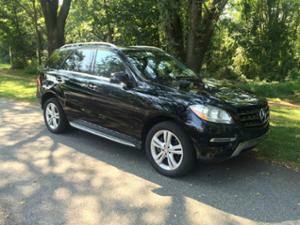 2014 Mercedes-Benz M-Class ML350 Bluetec 2014 MERCEDES-BENZ ML350 Bluetec. This ML has the P1 Package with Navigation, Harmon Kardon sound, Running Boards. Its Garage kept. Runs phenomenal and gets great fuel economy. I get 25mpg city and 28-29mpg Highway. 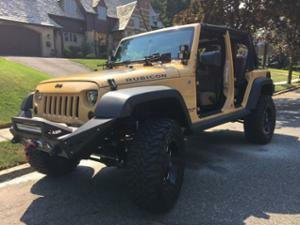 Description:Used 2015 Jeep Wrangler for sale - $14,500.00 with 20,575 miles. 2015 Jeep Wrangler A TRUE SHOW STOPPER TONS OF CUSTOM EXTRAS -CUSTOM BUMPERS AND SIDE RAILS -CUSTOM INSTALLED LIGHTS -UPGRADED TIRES AND WHEELS -CUSTOM SUSPENSION -SOFT TOP AND HARD TOP INCLUDED NO SMOKING IN CAR, WELL MAINTAINED.